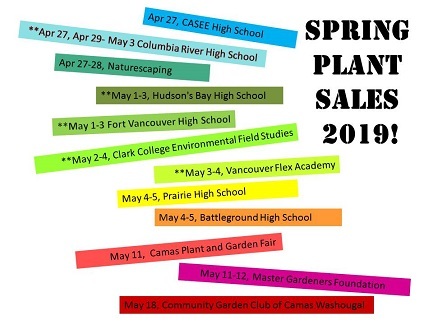 Clark County, Washington, USA has an AMAZING number of plants sales every spring! Here is a list of the sales we know about so far. And don’t forget, the Community Garden Club of Camas Washougal‘s annual Plant Sale takes place May 18th, 9am-3pm, in the basement of the Camas United Methodist Church, 706 NE 14th Ave., Camas, WA. May 2-4, Clark College Environmental Field Studies, native plants – further details TBD. May 4-5 (9am-2pm), Battle Ground High School, vegetables, annuals and perennials, 300 W. Main St., Battle Ground, in the school’s adjacent green houses. May 4-5 (9am-2pm), Prairie High School, vegetables, annuals and perennials, 11500 NE 117th Ave., Vancouver.